Del Oehms Hamilton is employed by Library Associates Companies as Project Manager for Tulane University’s Library Recovery Center and coordinating a multi phased recovery project to facilitate dealing with the effects Hurricane Katrina had on the collections and materials. Del has 23 years of library experience on all levels with over 20 of those in the academic setting. She most recently served as Library Systems Coordinator for Slippery Rock University. 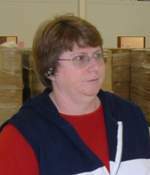 At SRU she also served as library Department Chairperson for 13 years and as an Instructional Materials Center Librarian first at Central Michigan University before joining the faculty at Slippery Rock in 1990. She has extensive experience in coordinating projects and operations of all sizes. She has participated in statewide initiatives with the Keystone Library Consortium since its beginning. In addition, at Central Michigan University she served as a professor for the Library Science program and taught courses on Cataloging, Children’s Literature, and Young Adult Literature. She received her BS in Library Science and Education from Mississippi University for Women and her MLS from University of Southern Mississippi. Professionally Del is a past president of the Endeavor Users Group and served as an elected member of the Executive Board for 7 years. She served on the Keystone Library Network Council and chaired several statewide projects. She is a member of the American Library Association, LITA, and ACRL and has served those organizations in various capacities. With the MUWAeA Del has served on the Information/ Technology Management Committee and is currently chair. She worked on the Visibility Committee for Homecoming 2008 that created a visible presence by the MUWAeA throughout the event. She has served on the Board of Directors for 2008-2009.